Even though the past couple of days have had some selling pressure, Bitcoin has still maintained a short-term bullish phase and is still operating within a bullish bounce off of some key levels. There are some important zones coming up we need to watch. As a reminder, the wavy red horizontal lines represent the longitudinal position of the planet Saturn. 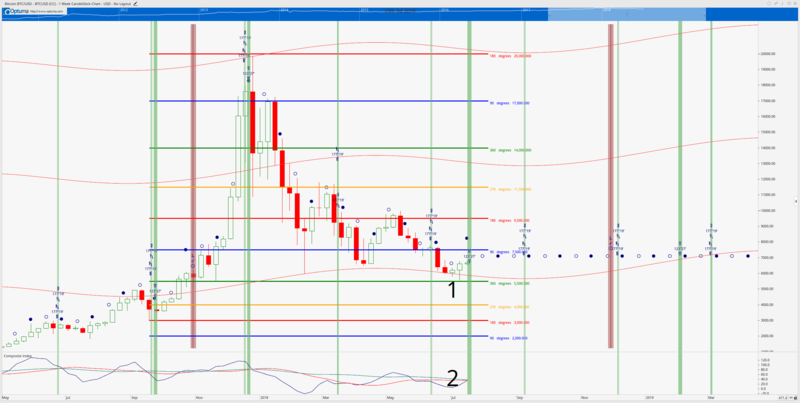 Those Gann Planetary Lines act as natural support and resistance levels. The other horizontal levels represent price levels in Gann’s Square of 9. And, finally, the vertical levels represent the specific longitudinal coordinates between two specific planets at a specific date. For example, the brown vertical bars represent a Jupiter – Sun Conjunction (close together to form a line to another, or sharing the same angle). What is interesting about that specific aspect is that it has shown up nine times in Bitcoin’s history. Eight of those nine times have yielded exponentially higher prices from one Jupiter-Saturn Conjunction to the next, only once has it yielded lower prices. But let’s look at the chart. This is a weekly chart of Bitcoin. We can see prices finding consistent support on the Gann Planetary Line of Saturn which coincides with the 360-degree Square of 9 value area. Additionally, this current Full-Moon lunar phase has actually yielded consistently higher lows and higher highs. If we actually trade this entire Full-Moon phase with a close higher than the open of the phase, that will be the first actual higher close since the all-time high – a final nail in the coffin of the bear market. One of the first signs of a change in a mid to long-term trend is when the inverse Moon-Phase’s price action completes positively and the in-trend Moon Phase fails to complete. The levels of the Composite Index add credence to the bullish phase coming and the bearish market ending. We have a clear divergence between price and oscillator. We also observe some extremely bullish buying conditions with this oscillator. Ultimately, what we want to see is this Full-Moon phase to close higher than the open – the end of this Moon Phase is on Friday the 13th. And during the New Moon, we want to see flat or rising prices. Friday the 13th is also when the a 120-degree angle between Uranus and Venus appears – that particular aspect often appears at swing highs and swing lows.